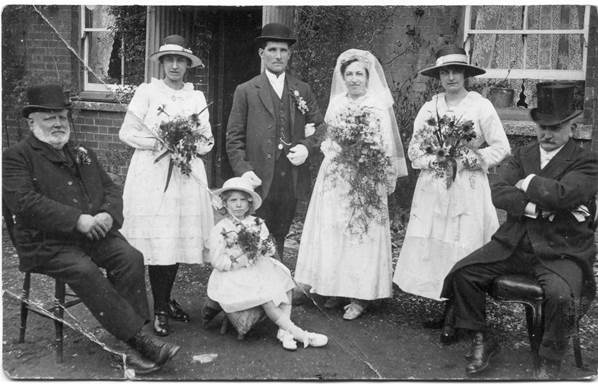 We have recently been given copies of three photos of the wedding of William and Ethel (as she was known). The wedding took place in 1920. One of the pictures, with the largest group of guests we have seen before and you can click here to see it. Today we’ll look at a smaller group and ponder on who the people might be. The location is clear here. It is taken outside Number 2 Parsonage Lane which was the home of the Cooper family. We know the bride and groom and we also know that the young bridesmaid was a niece of the groom. We do not know who the other bridesmaids were. But perhaps we are most interested in the two older men. We guess they are the fathers of bride and groom – but which is which. The one on the right looks utterly fed up with the whole business. If he is Jacob Bolter Cooper, father of the bride, he’d have been about 80 by then. That was a good old age back in 1920. He may well have had enough. John Blake, father of the groom was around 70. The mothers of both parties to the marriage were already deceased. So, once again, we appeal for help in identifying, particularly the two men. This entry was posted on October 29, 2014 at 6:00 am and is filed under Museum. You can follow any responses to this entry through the RSS 2.0 feed. You can leave a response, or trackback from your own site.